When speaking about the perspectives of Orange Revolution, it is necessary to specify three major actors of the process: the nation (in town squares and in front of TV screens), the opposition and the authorities. Their relationship predetermines the end of Orange Revolution. The basis for discontent of the nation with the authorities is very important; the politicians have to identify, actualize, or, if needed – create the basis. It is instrumental to reveal the reasons of this discontent and to do so as to turn the discontent of minority into discontent of majority or at least to make the majority passive. What could the Russian nation be unhappy with? The most serious source of the revolutionary potential is social-economic situation of the Russian citizens, however, it has become more a less stable recently. But most importantly – is this stabilization on high oil prices or a real sally? This situation might be favorable for the development of „orange“ moods. The Russian nation is very patient, however when out of patience, there is nothing worse than the Russian riot. Stability might also be threatened by such unsuccessful reforms as the so called monetarization of benefits. Another irritating aspect is talks of the authorities that huge amounts of the Stabilization Fund cannot be used internally because of increasing inflation (whereas the officials are benefiting from the increased income of the country). The second source of discontent of the nation with authorities is the fall of the Russian glory: retraction in the post- Soviet space, weakened army, stagnation of industry of high-technologies, „handing over“ Ukraine to the orange etc. It is assumed that firm statements of the Kremlin on plans of the United States to deploy the AMD elements in Europe and on possible withdrawal from the Weaponry Treaty is the attempt of the Kremlin to thrill the Great Russia’s spirit strings. In terms of the „orange“ potential of the Russian nation, the most important thing is that the increasing discontent with the authorities might turn into a real wish to replace the authorities via the „orange“ revolution. However, it might also become treatment of „sick“ authorities and suppression of „the orange“. With a view to changing the attitude of the Russian nation, the opposition needs several things. First of all it needs the idea and leader. 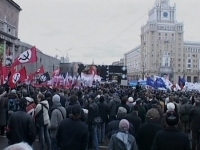 The Russian „discontent“ declare: „we are against Putin“. Although this slogan is in compliance with the „orange“ technologies, it is not appropriate. V.Putin is still quite popular and so far the opposition has no clear leader able to compete with Putin. One of the major disadvantages of G.Kasparov is that he is Jewish. M.Kasyanov and E.Limonov are also personalities not appropriate for revolution. There should be an absolutely new and original personality. It might be the idea of „the Great Democratic Russia“. What is specific about that, is that it encompasses both – majesty and democracy. The current opposition is democracy without majesty, whereas the current authorities imply majesty without democracy. Connection of the above two aspects could be efficient and attractive for the Russian nation and partially – for the West. The second aspect is support of youth. National Bolsheviks, their youth and the youth of the party „Jabloko“ might become a key revolutionary power. It should be noted that youth in favor to the authorities are strong enough to fight with the oppositionists both in terms of their capacity and organization skills. Besides, “anti-orange” activity, organized by „youth products“ created by the Kremlin will be increasingly funded. Another serious obstacle of the opposition is media: practically all the media is controlled by the authorities. The only information channel used without interference of the authorities is Internet having more than 25 million users. It might happen that in case of revolution, quite a big part of journalists supporting the authorities, change their position. Another important aspect is territorial basis of revolution. They say that everything in Russia is controlled in Moscow, maybe in St.Petersburg. However, although the citizens here are more democratic then elsewhere, authorities of these cities are certainly supporting the Kremlin. Financing is also of importance. „The orange“ usually are funded by foreign countries, however, local supporters are also necessary. One of such supporters appeared in Russia and...lost everything. Nonetheless, the West surely would not spare money for revolution in Russia. Efficiency of response of the authorities to „orange“ revolution is predetermined by its determination to fight, consolidation and independence from foreign countries. It is assumed that situation with the governing elite in Russia is not as good as it might seem from first sight. The elite has lost contact with the nation, is corrupted and disunited. Supporters of V.Putin might betray him in critical situation, however, even though betrayed by part of his collaborates, he might apply to the nation for help. The question is on whether he WILL apply to the nation. Today the extent of V.Putin and his elite’s independence from the West is not clear. Only being fully independent they could go to the very end – even to tanks. Orange Revolution is a complex and diverse process, the key principle of which is the relationship of the triangle – authorities, nation and opposition. The objective of both, the authorities and the opposition is to affect the nation so as to make it take one or another position. Having evaluated all circumstances, it becomes clear that perspective of the „orange“ revolution in Russia today is not very serious. A key disadvantage of the opposition is absence of one clear leader and lack of the nationally acceptable idea. A serious advantage of the authorities is control of media and „own“ youth.